I said before in my previous post that I had some problems with my GX EV3 4x4 chassis that I needed to fix. Once again, it's more gear grinding/clicking, but this time it's only in the front and rear differential gears. The grinding occurs whenever the chassis tries to drive into a wall or when it tries to drive in different conditions (because as an SUV it should drive smoothly in dirt or uneven terrain). 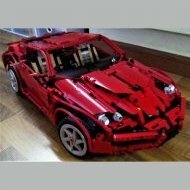 What also annoys me is that when I push the car, instead of letting the motors move, the differentials make clicking noises that, like I said before, sound like a machine gun. 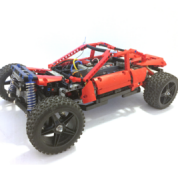 I really need help so I can stop the differentials from clicking so when the car tries to drive into the walls, the motors won't still move while the differentials click, and so the car can be a lot more versatile on uneven terrain (such as what I used for testing, blankets) without the differentials causing a problem when the car moves. Here's some pictures of the bottom of the chassis. The large motors you are using have a lot of torque, much more than the differentials like to handle. If @JJ2's suggestion doesn't completely solve the problem you may want to look at gearing up the motors to reduce the torque and reducing their RPMs to keep the car speed the same. Thanks for the help. I'm still waiting for more responses, but I appreciate the help from you two! Those differentials really can't handle much torque. Maybe you could trying adding some gear reduction after the differentials. Or you could remove the diffs altogether and use a 12t bevel driving a 36t double bevel gear. I found a spot in the chassis that may have been causing the clicking. It's the two 8t gears that center the output of the gearbox. 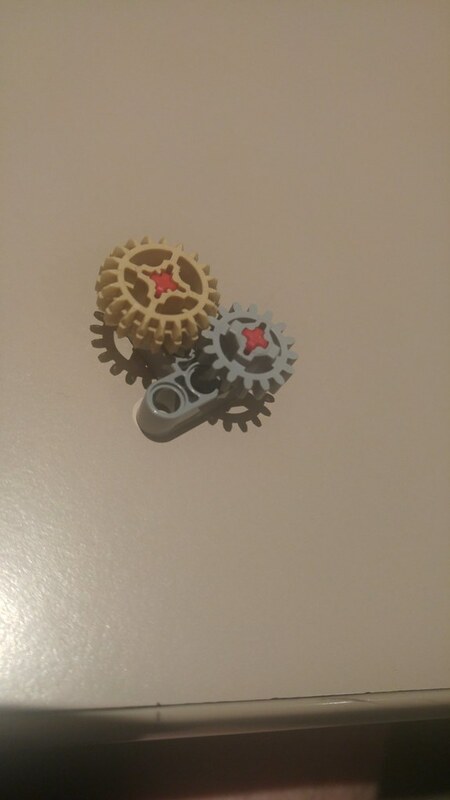 Should I buy some universal joints from BrickLink to center the output instead of the gears? I guarantee it would be better but I don't know whether it would stop the grinding in the differential or not. No, universal joint will weaken it. 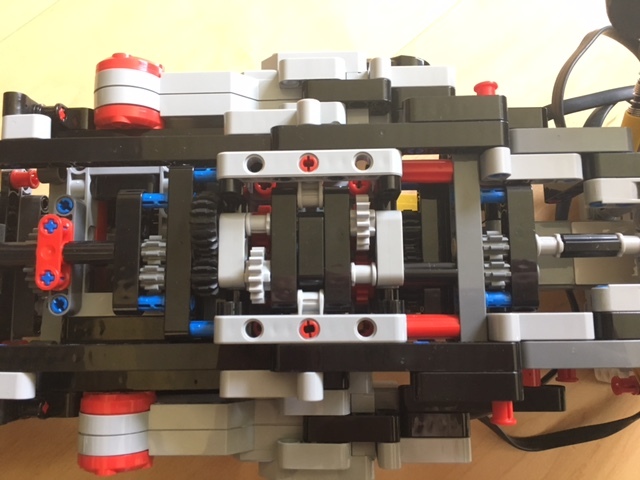 Looking at the space u have, an alternative is to double up - use two rows (separated with beams) of 8t gears instead of just 1. Also possible to increase the number of columns (i.e. have dummy columns of 8t gears), although this could add to the frictions. These are two methods I often use in my models whenever gear skips/grinds. Turns out it wasn't really the 8t gears that were causing the problem. I just had to do more reinforcing near the diffs and now I only get the clicking in the rear diff. Issue halfway through being solved! How do you brace the diff it self? I usualy 'clamp' it between two gears. One is driven and the over one just free roles, to keep the gear from getting pushed away from the driving gear. For a full-time 4x4, the entire drive-train has to endure immense torque and pressure when travelling on flat surface - it is just not meant for that kind of terrain. 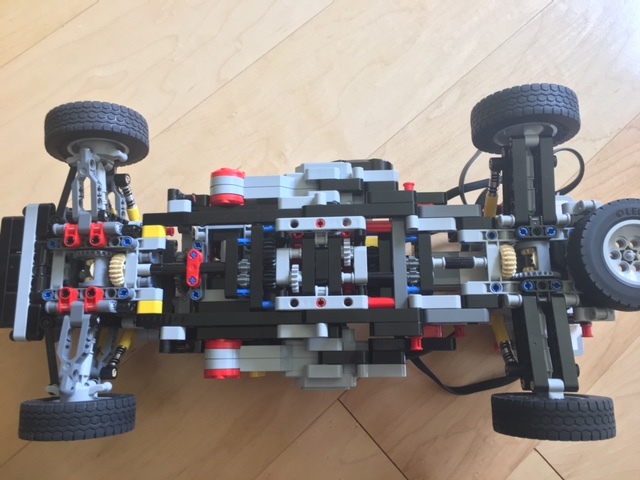 Many Lego models avoided this problem either with separate motors for front and back, or do away with differentials and gearbox. However, for your model, since you have connected two differentials plus a gearbox (all being potential points of weaknesses) within the same drive-train, I can't help but suspect that somewhere, somehow, at some time the built-up stress must be let off .